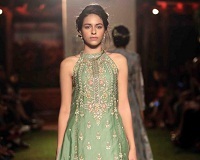 Fashion fraternity got together to present a five-day extravaganza and introduce audiences to global developments in the world of fashion at the just concluded Lakme Fashion Week Win Summer/Resort 2018. These power-packed presentations saw a lot of emphasis on sustainable fashion. Apart from young designers taking progressive form of fashion, celebrities like Dia Mirza and ace designers like Rajesh Pratap Singh are rigorously promoting it. On Day-2, the runway saw the best of sustainable fashion, with labels like Lenzing presenting eco-friendly attires. Union cabinet minister of textiles and information & broadcasting Smriti Irani also conveyed a message on sustainable fashion in Northeast India, in collaboration with UN. Talking about the dire need for sustainable fashion in the country, she said given the clarion call globally, where more and more conscientious consumers want to enjoy luxury, want to enjoy the magic of every weave, but not at the cost of environment, ensuring that women, especially who are working in this sector get due justice for their hard work. This is an important conversation, especially to take place at LFW, where the world comes to see the power and magic of Indian fashion. Agreeing with her eco-philosophy, leading couturier Anita Dongre, said it is imperative to adopt more sustainable practices as an industry. Slowly, more people are choosing these benefits in addition to demanding change in how the fashion industry approaches production and its effects on the environment. Sustainable fashion is the need of the hour. Day one started with a Next Gen show where an array of new labels showcased their designs on the runway. Bobo Calcuttawalla showed a technicolour collection with bright, abstract art paintings printed on fabric. Both traditional and western silhouettes were used as a canvas for the designer’s bold prints. Padma Raj Keshri presented a collection that included draped fabrics in white and indigo that mixed tradition with modernity. Mohammed Mazhar’s collection was almost entirely white, with the addition of black prints and nudes layered in floaty shapes. The brand Two Point Two showcased modern casual wear and used pinstripe and checked fabric to contrast smart with relaxed styles. Finally, Helena Bajaj Larsen presented a jewel toned collection that included metallic, structured jackets and sheer tops. While unveiling her collection, Dongre opined today, fashion is an outlet to express confidence and individuality and is no longer about following trends blindly; and while fashion choices are more or less influenced by society, culture or celebrities, the modern woman is more likely to be influenced by her own inclinations and preferences than what’s shown on the runway and global trends. Fashion has now been more personalised than ever and even redefined with a wave of positive change from the quintessential to more versatile and personality-driven styles. The designer closed the opening night with her collection combining a symphony of subtle pastels, exquisite light fabrics and floral and botanical motifs. The silhouettes and fabrics were elegant and comfortable. Instead of restrictive clothing, free-flowing garments took centre stage in the form of billowy pleated midi skirts, wrap tops and loose palazzo pants. Summer is the time to wear easy breezy silhouettes, and the 50s presented the perfect inspiration to create garments that won’t bog you down. 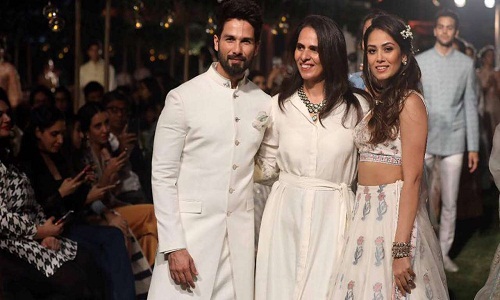 Bollywood's much-loved couple Shahid Kapoor and Mira Rajput were her showstoppers. Ritu Kumar showcased her Label collection that mixed handloom with hip hop, ‘Hip Hop Baroque’ and featured metallic pleated textiles and prints in floaty silhouettes accessorised with fanny packs and trainers. At the IMG Reliance-United Nations’ North East Mojo, a concoction of shades, styles and stories from Manipur, Sikkim, Meghalaya, Assam, Nagaland and Tripura unfolded on day two. Amid the lively performance by the Tetseo sisters, it’s the weaver’s tales, perhaps deserve the most attention. Manipur designer Richana Khumanthem, narrated a story utilising motifs and textiles on the ramp and off it, and shared tales of women artisans and how the biggest problem of it all is the availability and accessibility of raw materials. Having presented a collection titled ShaKiLum, a Meghalaya-based designer Daniel Syiem brought to the ramp the hard-work of women weavers of RiBhoi district in the state. He said that the team work with women who struggle a lot every day. They have turned it into a business for themselves and are now able to support their families. Syiem presented a collection rich in layered silhouettes. The day also saw the collection by the Good Loom who showcased menswear using ethically produced cottons and linens. The collection was smart casual with a mix of blazers and more relaxed, button-down jackets. Promoting sustainable fashion in India, the Woolmark Company and couturier Manish Malhotra unveiled a capsule collection using natural fibre Merino Wool titled ‘Inaya’. This is Malhotra’s first Merino wool line, which presents the fibre in a way like never before. The signature collection will be available to the designer’s high-end clientele his stores in India, Dubai, Europe, and Britain. Inaya presented wool saris for women and bandhgalas and sherwanis for men, throwing the spotlight on Merino wool as a natural, biodegradable and renewable fibre. Usha International, India’s leading manufacturer of sewing machines, also introduced its sustainable fashion initiative Usha Silai. It is an innovative fashion concept showcasing eco-friendly and creative concepts of four designers namely Soham Dave from the Dholka cluster in Gujarat, Amit Vijaya and Richard Pandav from the Kaladhera cluster in Rajasthan, Sayantan Sarkar from 24 South Parganas Mastikari cluster in West Bengal and Sreejith Jeevan from the Puducherry cluster. The sustainable fashion concept aims to empower women in rural areas with skills and resources to create clothes and accessories that can be retailed in the urban fashion market.